Properties in Hennef (Sieg) average 4.5 out of 5 stars. 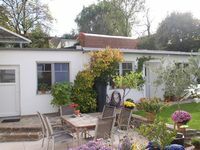 Property 7: Apartment "An der Burg"
Bonn: Bright and cozy 30's house. Rheinpromenade 2min. on foot. Property 17: Bonn: Bright and cozy 30's house. Rheinpromenade 2min. on foot. modern cozy apartment with terrace about 40sqm. Property 23: modern cozy apartment with terrace about 40sqm. Wellness House directly on the victory, "Simply Beautiful Am Wasserfall"
Property 29: Wellness House directly on the victory, "Simply Beautiful Am Wasserfall"
Wellness House on the victory, "Simply Beautiful"
Property 45: Wellness House on the victory, "Simply Beautiful"
Cozy 120sqm cottage with sauna and fireplace in the Siegtal: great for families! Property 50: Cozy 120sqm cottage with sauna and fireplace in the Siegtal: great for families! This was a great house to experience our trip to Bonn. Host was responsive, house was clean, quiet and comfortable for our family of four. Grocery, bakery and even a restaurant within walking distance. Close to Rhein, bus stop to downtown, and another walk takes you to a beautiful park you can spend all day in. Washer and dryer in basement were very helpful to us in our stay here during our longer Europe tour. Everything about my stay at Jutta and Paul's gave me the peace of mind and relaxation I sought during my two-day trip. The smart layout of the apartment made it feel much larger than it's physical dimensions. The living room area had ample room to relax, with clean, modern furniture and touches of welcoming warmth. They provide a generously-sized workspace and excellent lighting for work needs. The kitchen, designed in the corridor through to the bedroom, was appointed with everything I needed to make full meals, and yet had no additional clutter. The bedroom felt incredibly spacious, with a comfortable bed, ample curtains, and darkening shades, too. Jutta and Paul felt like friends immediately, and enthusiastically helped me navigate transportation, and other needs, given I am not a German-speaker. (Jutta even noticed that my coat didn't seem warm enough for the brisk temperature that day and insisted that I borrow one of theirs.) There are many more positives, but suffice it to say that I highly recommend Jutta and Paul's guesthouse, and them as hosts.